We are a dealer for Smokin Brothers wood pellet grills. Also, we sell a full line of pellets, seasonings, rubs and BBQ sauces. Smokin Brothers’ families have designed these grills to take your grilling to a new level, whether it is for family BBQs in the back yard, competitions, or anything in between. Smokin Brothers Wood Pellet Grills are manufactured and assembled in Southeast Missouri, and are designed to give you consistent cooking every time. Smokin Brothers grills cook with indirect heat, preventing flare ups. Each grill comes complete with a drip pan to catch the grease and convection fan to circulate air around the food, eliminating the need for a rotisserie. The digital thermostat control maintains a constant temperature from 180 to 375 degrees and a high setting for temperatures above 400. Simply plug in your Smokin Brothers grill and set it to 180 to start. After lighting, set your temperature as needed and let the grill do the rest. In 10 to 15 minutes you are ready to begin your BBQ masterpiece. The 20 BBQ grill is the perfect size for any family that wants to start mastering backyard cooking techniques. It allows you to smoke, bake, grill and sear with the heavy duty porcelain grids. The 20 features 527 square inches of cooking surface. 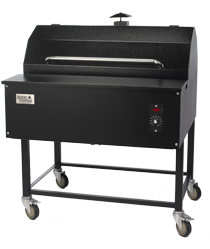 The 24 BBQ grill has the same features as the 20 but is four inches larger equaling 646 square inches of cooking surface. 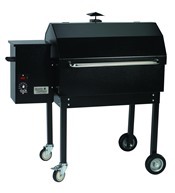 The 30 BBQ grill gives the added space for a large family or group of friends. This grill allows for plenty of room for the main and course and side dishes to be cooked at the same time. The 30 is a larger version of the 20 and is our best seller with 792 square inches of cooking surface. The Premier models are the ultimate in backyard grilling. They come standard with an insulated fire box, built in work surface and integrated meat probe. They come in three sizes. 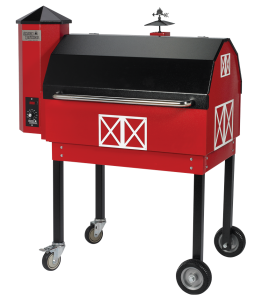 If you are looking for a custom grill, the Barn-B-Que might just be the grill for you. It features the same easy to use steady smoking and grilling as the rest of the Smokin Brothers grills but with a great custom look. No “filler” or “base” wood, chemicals, binding agents or other contaminants are used in the manufacturing of Smokin Brothers Premium Pure Wood pellets. 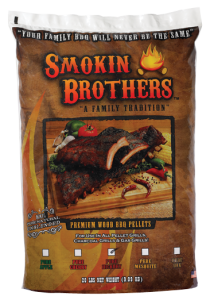 Smokin Brothers’ Quality pellets are produced to exact density specifications enabling them to burn efficiently delivering rich natural flavor. Unblended means 100% of the flavor you choose. It is up to you to mix and blend the varieties. When we say “Pure Hickory” it is 100% hickory. Try the different flavors for yourself.